The QNAP VS-12156U-RP Pro VioStor NVR (Network Video Recorder) is the high-end 2U chassis network surveillance server which supports high quality real-time video/audio monitoring, megapixel recording (up to 10-megapixel), and playback of multiple IP cameras. The 12-drive VS-12156U-RP Pro offers maximum 48TB physical storage (using 4TB hard drives) with hot-swappable RAID technology for high data redundancy. The VS-12156U-RP Pro is capable of H.264, MxPEG, MPEG-4, and M-JPEG recording from up to 56 IP cameras. The standalone Linux-based NVR can be easily set up in 6 steps by Internet Explorer without extra software required or even without PC via the HD (high definition) VGA local display. 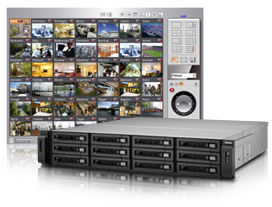 The VioStor NVR is compatible with more than 1,500 IP cameras and video servers from popular brands including AXIS, ACTi, A-MTK, Arecont Vision, AVTECH, Brickcom, Canon, Cisco, CNB, DIGITUS, D-Link, EDIMAX, ELMO, EtroVision, GANZ, Hikvision, iPUX, IPX, IQeye, LG, LevelOne, Linksys, Messoa, MOBOTIX, NAKAYO, Panasonic BB/BL/i-Pro, SANYO, SHANY, Sony, Samsung, Sharp, TOA, TOSHIBA, TRENDnet, Videosec, VIOSECURE, VIVOTEK, Y-CAM, and Yokogawa. QNAP VioStor NVR (Network Video Recorder) is designed for high quality megapixel recording, and high performance real-time monitoring. It is a reliable standalone NVR with powerful surveillance features and mass storage capacity. Based on Linux OS, the NVR supports H.264, MPEG-4, M-JPEG and MxPEG recording from over 1,100 network camera models from popular brands. 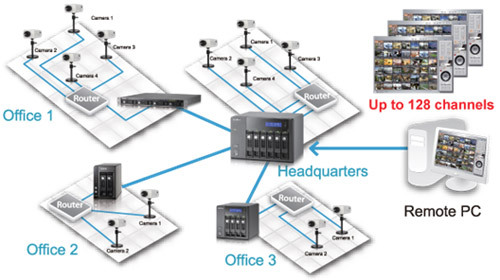 With QNAP's unique multi-server monitoring feature, multiple VioStor NVRs can be cascaded together for central monitoring of up to 128 channels of video surveillance. The VioStor NVR is an ideal solution for small, medium, and large facilities that integrate IP cameras, advanced intelligent video analytics and RAID storage technologies to help companies provide a safe environment for employees and protect company assets. The VioStor NVR supports H.264, MPEG-4, M-JPEG, and MxPEG recording from over 1,000 network camera models of many popular brands. The VioStor NVR supports PC-less system configuration, monitoring of IP cameras over the network, and video playback by a monitor or high-definiton TV, a USB mouse, and a USB keyboard. You can connect to the VioStor NVR and add other QNAP NVR servers to monitor up to 128 channels on a PC over LAN or WAN. The VioStor NVR supports intelligent video analytics (IVA), such as motion detection, missing object, foreign object, out of focus, and camera occlusion to provide fast video retrieval. The compatibility between the NVR and the surveillance devices are strengthened to provide more event handling options when events are detected or alarms are triggered on the IP cameras. With VMobile installed on your Android phone, iPad, iPhone, iPod touch, or Windows PDA phone, you can monitor your home and office and receive instant event alert anytime, anywhere. 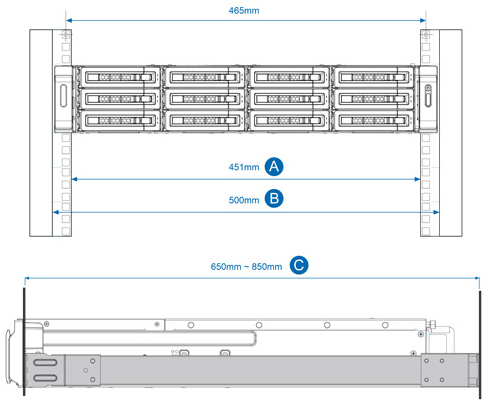 The VioStor NVR supports RAID 1, 5, 6, 5+hot spare, 6+hot spare to protect the recording data against hard drive failure. Single disk, JBOD, and RAID 0 are also offered**. You can press the one-touch-auto-video-backup button on the front of the NVR to copy the data from the NVR to an external storage device. The VioStor NVR is a Linux-embedded system which is more powersaving and less vulnerable to virus attack compared to PC-based surveillance solutions. The QNAP Finder is a value-added utility developed to help you quickly search all the VioStor NVR servers and all major brands of IP-based cameras and network video servers. The VioStor Player allows you to play the recording files on your Windows computer or the VioStor NVR servers. You can select to add digital watermark on the exported videos and snapshots. The Watermark Proof allows you to check if the exported files were modified. The V-Mobile is a mobile video surveillance utility for you to monitor the network cameras on the VioStor NVR. With V-Mobile installed on Windows PDA phone, iPad, iPhone, and iPod, you can monitor your home and office, check the safety of the children at home and be alerted by the intrusion alarm anytime, anywhere. * For VioStor Pro series NVR only. ** The RAID levels supported depend on the number of hard drives installed. The VioStor NVR supports megapixel recording (up to 10-megapixel) from various IP cameras. The VioStor NVR provides an interface for the users to enter the JPEG CGI command of their IP cameras to retrieve the video and audio data from the IP cameras. The VioStor NVR supports real-time digital watermarking to protect the videos and snapshots from unauthorized modification. The Watermark Proof utility is provided to verify whether or not the videos and snapshots are original. VioStor NVR supports widescreen VGA monitor or TV of different resolutions, up to full HD (1920 x 1080). The PTZ (Pan/Tilt/Zoom) cameras can be adjusted directly and the preset positions of the IP cameras can be viewed on the local display interface of the VioStor NVR. Digital zoom (in/out) of the video image is supported on the monitoring and playback interfaces of the NVR. When an event occurs, an alert icon will be shown instantly on local monitoring page. The alert details can be viewed by clicking the alert icon. The VioStor NVR supports convenient video search by date and time on the local playback interface. The VioStor NVR supports video playback directly on a VGA monitor or TV. The VioStor NVR can be set up in simple steps on the local display interface. Connect to one VioStor NVR and monitor up to 128 channels from other VioStor NVR servers over LAN or WAN by an IE browser. The PTZ (Pan/Tilt/Zoom) cameras can be adjusted directly by the web user interface of the VioStor NVR. 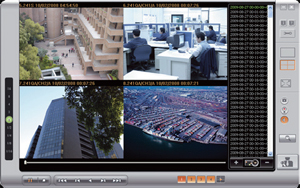 The preset positions of an IP camera can be viewed by clicking the corresponding number buttons on the monitoring page. 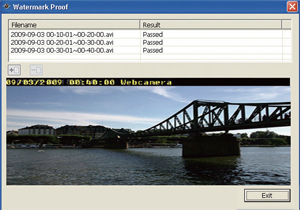 The time interval can also be configured on the PTZ cameras for periodic monitoring. When alarm recording is enabled and an event occurs, an alarm icon is shown instantly on the monitoring page. The alert details can be viewed by clicking the icon. Digital zoom (in/out) of the video image is supported on the monitoring and playback interfaces. The VioStor NVR provides an E-map function for users to upload the digital maps and indicate the locations of the IP cameras of a monitoring location or region. The VioStor NVR provides real-time monitoring as well as real-time snapshot. Users can take a snapshot of the monitoring screen anytime. 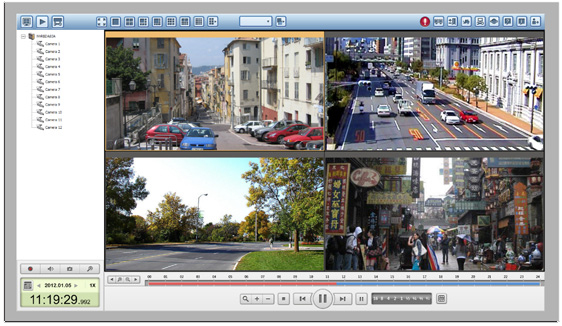 Use the multi-view playback feature to divide a video equally into multiple sessions for playback in a multi-view window, or play the videos of multiple IP cameras in the multi-view window simultaneously. The VioStor NVR supports quick video search by date and time, timeline, event, and intelligent video analytics (IVA), which includes motion detection, foreign object, missing object, out of focus, and camera occlusion. The storage capacity of the VioStor NVR can be expanded by connecting to multiple QNAP Turbo NAS servers. The VioStor NVR supports scheduled remote replication for secure recording backup to a remote NAS on LAN. Configure and press the one touch auto video backup button to copy the recording data instantly from the NVR to an external storage device via the front USB interface. The administrator can create multiple users on the VioStor NVR and assign them to different user groups (administrator, system manager, or user) with different rights of monitoring, playback, PTZ control, and audio monitoring. The VioStor NVR supports automatic user logoff from idling configuration pages. The administrator can set the timeout period to log off the users when the idling time has reached. Specify the host or IP connections to be allowed and denied to access the NVR. View the record of users currently logged on and previously logged on to the NVR. The VioStor NVR provides detailed event logs of system warning, hard disk error, network disconnection, UPS status, and access to the networking services of the NVR and video recordings. The VioStor NVR supports RAID 0, 1, 5, 6, 5+hot spare, 6+hot spare, single, and JBOD disk configurations. Its hot-swap design allows a failed drive of a disk volume, RAID 1 or above, to be replaced by hot swapping without turning off the NVR. The storage capacity of a RAID configuration can be expanded by replacing the hard drives with larger ones. All the data will be kept and seamlessly moved to the newly installed hard drives. There is no need to turn off the NVR during the process. Upgrade the disk configuration to higher RAID level with the data retained without turning off the NVR. Self-Monitoring Analysis and Reporting Technology (S.M.A.R.T.) helps the administrator monitor the hard disk drives status. The VioStor NVR supports Hard Drive Health Scan (HHS) for disk checking and bad blocks scanning. The VioStor NVR supports automatic system startup after a power recovery. The VioStor NVR supports APC, CyberPower, MGE, and YEC UPS devices to provide continuous services 24/7 against unexpected power outage. The LAN ports of the VioStor NVR can be configured in failover mode which allows the NVR to sustain the failure of one network interface and provide continuous services. The LAN ports of the VioStor NVR can be configured in load balancing mode for bandwidth aggregation to boost file transfer speeds. It works with managed Ethernet switch with 802.3ad configured. Four IP settings can be configured on the NVR to allow network access from four different subnets. The VioStor NVR supports dynamic DNS (DDNS) for convenient access to the system via a domain name instead of a lengthy IP address. This feature allows the connected IP cameras to synchronize their date and time settings with the NVR. The NVR can be set up in 6 simple steps by the local display or web-based interface (Internet Explorer). All system configurations, monitoring, and playback features of the NVR can be managed by the web-based interface. 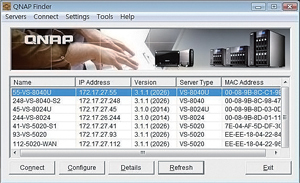 QNAP provides an intelligent software utility Finder for quick IP cameras search and system settings on the local network. Powered by Intel® Xeon® E3 CPU and ECC DDRIII memory, the VioStor NVR delivers superior performance for surveillance applications. The VS-12156U-RP Pro is equipped with two power supply units, each of which is capable of supplying the power for the entire VioStor NVR independently. If one of the units fails, the other one will take over to supply the power to ensure continuous operation of the VioStor NVR. The failed power supply unit can be replaced without turning off the NVR. The Linux-based VioStor NVR is more power-saving and less vulnerable to virus attack compared to PC-based surveillance solution. The VioStor NVR supports up to 48TB of physical storage capacity (4TB hard drive x 12) for recording large amount of video data in a long period of time. The VioStor NVR supports different event types, including motion detection, alarm input, connection failure, recording failure, and user-defined event to trigger follow-up actions. When the IP camera detects any movement, the defined actions will be activated. When the VioStor NVR receives a signal from the IP camera's alarm input, the defined actions will be activated. When the VioStor NVR fails to connect to the IP camera, the defined actions will be triggered. When the VioStor NVR fails to record video due to hard drive failure or system crash, the defined actions will be triggered. The VioStor NVR supports user-defined events. The administrator can enter the CGI command in the browser to trigger the event, and the defined actions will be activated. The NVR supports different actions when an event is triggered. These actions include multi-channel recording, adjusting the PTZ camera to the preset position, alarm output, built-in buzzer, email & SMS alert, and user-defined action. When an event is triggered, the VioStor NVR starts recording one or more channels at the same time. When an event occurs, the PTZ camera will be adjusted to the specified preset position for monitoring and recording. Use HTTP URL to activate further actions. When an event occurs, the alarm output from the IP cameras will trigger other alert systems, such as lighting system, auto phone dialing system, security system and so on**. The VioStor NVR sends an SMS message to inform the specified recipients when an event occurs. When an event occurs, the VioStor NVR sends an email with snapshot to notify the specified recipients. The buzzer of the VioStor NVR will sound when an event occurs. The VioStor NVR supports user-defined actions. Enter the HTTP URL from other surveillance systems. When an alert occurs, the NVR will activate other systems, such as extinguishing system, electronic control system, and air conditioning control system. * The administrator can enter the following URL in the browser to trigger the event: http://NVR IP/cgi-bin/logical_input.cgi?name=User-defined Event Name ** The VioStor NVR supports the alarm output of AXIS, Panasonic, SONY, ACTi, and VIVOTEK camera models. The VioStor NVR supports digital watermarking to protect the videos from unauthorized modification. The VioStor NVR supports quick search of recording data by date and time, timeline, event, and intelligent video analytics (IVA), including motion detection, foreign object, missing object, out of focus, and camera occlusion. Detects movement in the video. The moving objects of the search area are highlighted in red brackets. Detects a new object in the video. The foreign objects of the search area are highlighted in yellow brackets. Detects a missing object in the video. The missing objects of the search area are highlighted in yellow brackets. Detects if the IP camera is out of focus. Detects if the IP camera is obstructed. Note: The system is shipped without HDD. *Exporting recording file in playback by USB3.0 ports only. The rack kits for the VS-12100U-RP Pro rack mount series are only compatible with square-hole server racks. * For higher surveillance performance, please select more advanced PC models. 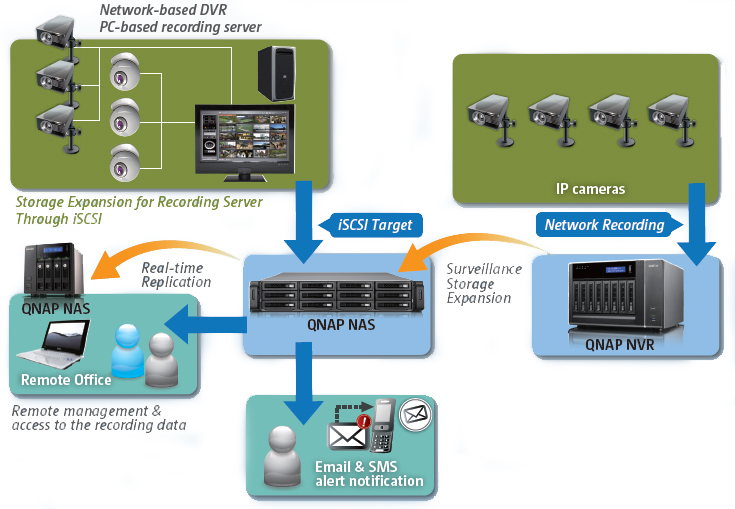 Download the QNAP Network Video Recorder and Total Surveillance Solution Datasheet (PDF).